Lockheed Martin and Northrop Grumman have double-digit gains year to date, while General Dynamics is in correction territory. Defense contractors Lockheed Martin (LMT - Get Report) and Northrop Grumman (NOC - Get Report) did not experience major setbacks in reaction to Britain's decision to leave to European Union. The third major contractor, General Dynamics (GD - Get Report) , took a minor hit. Based on this notion, military spending in the war to defeat ISIS appears to have trumped the adverse effects of the U.K. decision to leave the European Union. These three stocks began the year on Jim Cramer's list of 38 "anointed" stocks for 2016. This makes them important allocations to consider in a diversified investment portfolio. Cramer owns Lockheed in his Action Alerts PLUS portfolio. Cramer says this stock benefits from continued defense spending and also is known for its consistency in increasing dividend payouts. Lockheed Martin is a holding in Jim Cramer's Action Alerts PLUS Charitable Trust Portfolio. Want to be alerted before Cramer buys or sells LMT? Learn more now. Let's take a look at the daily and weekly charts for these defense stocks and the guidelines on how to trade them. Here's the daily chart for General Dynamics. General Dynamics closed Tuesday at $133.94, down 2.7% year to date and up 10.1% above its Jan. 20 low of $121.61, but in correction territory 12.9% below its 52-week high of $153.76 set on Aug. 19. 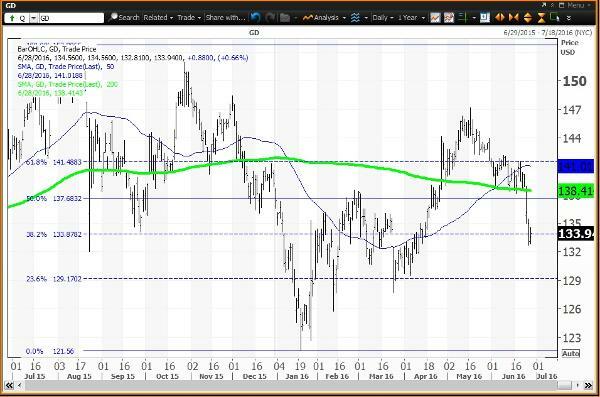 The horizontal lines are the Fibonacci retracement levels from the Aug. 19 high to the Jan. 20 low. The stock set its 2016 high of $147.16 on May 17, well above the 61.8% retracement of $141.49. The stock was below this retracement on June 21 before the "Brexit" vote. The stock closed below the 50% retracement of $137.68 on June 24 and after a low of $132.68 on Monday closed Tuesday above its 38.2% of $133.88. Here's the weekly chart for General Dynamics. The weekly chart for General Dynamics has been negative since the week of June 17 with the stock below its key weekly moving average of $138.38 but well above the 200-week simple moving average of $112.32. The weekly momentum reading is projected to decline to 56.62 this week down from 67.21 on June 24. The weekly chart shows a red line through the weekly price bars is the key weekly moving average (a 5-week modified moving average). 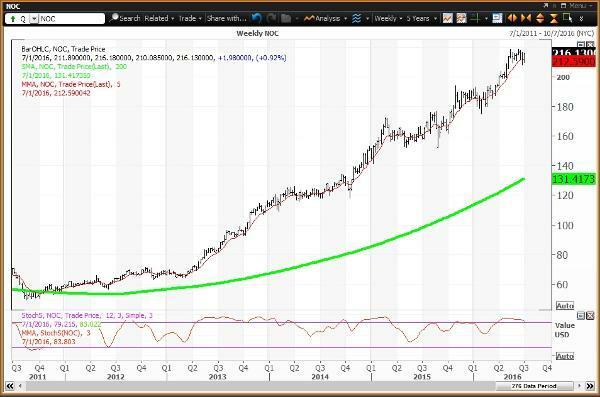 The green line is the 200-week simple moving average considered the "reversion to the mean". The study in red along the bottom of the chart is weekly momentum (a 12x3x3 weekly slow stochastic), which scales between 00.00 and 100.00, where readings above 80.00 indicates overbought and readings below 20.00 indicates oversold. A negative weekly chart shows the stock below its key weekly moving average with weekly momentum declining below 80.00 in a trend towards 20.00. Investors looking to buy General Dynamics should do so on weakness to $101.63 and $97.74, which are key levels on technical charts until the end of 2016. Investors looking to reduce holdings should consider selling strength to $141.39, which is a key level on technical charts until the end of this week. 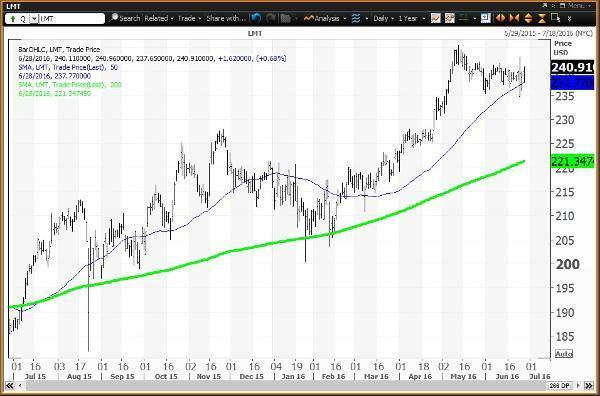 Here's the daily chart for Lockheed Martin. 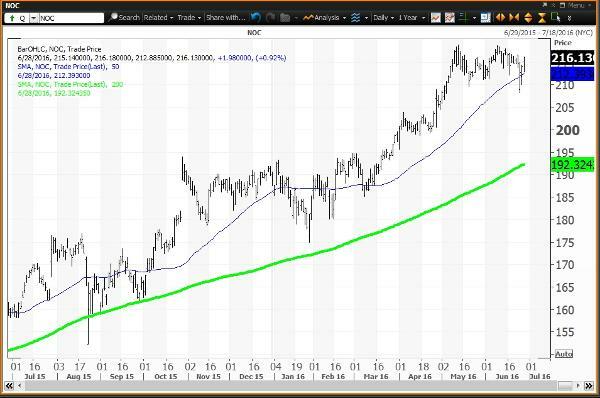 Lockheed Martin closed Tuesday at $240.91, up 10.9% year to date and up 20.2% since setting its Jan. 26 low of $200.47. The stock set an all-time high of $245.37 on May 12. The stock has been above a "golden cross" since July 24, 2015 when the stock closed at $201.04. A "golden cross" occurs then the 50-day simple moving average rises above its 200-day simple moving average and indicates that higher prices lie ahead. The stock simply traded back and forth around its 50-day simple moving average of $237.77 in reaction to the Brexit vote. 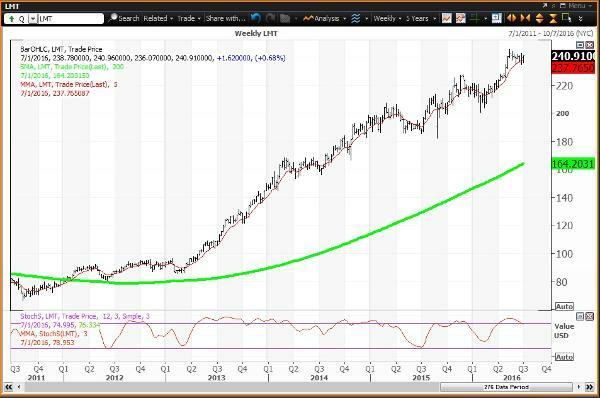 Here's the weekly chart for Lockheed Martin. 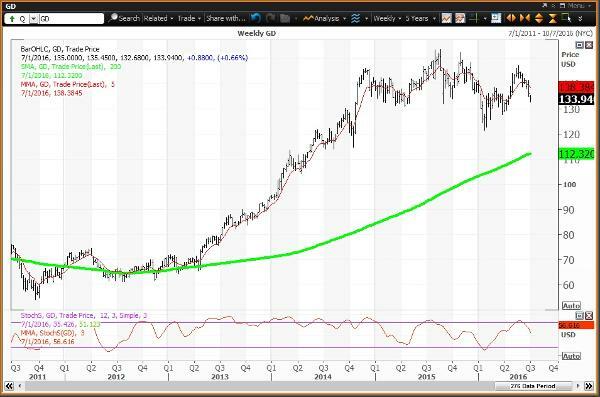 The weekly chart for Lockheed Martin is neutral with the stock above its key weekly moving average of $237.77 and well above the 200-week simple moving average of $164.20. The stock has been above its 200-week since the week of Jan. 20, 2012 when the average was $81.10. The weekly momentum reading is projected to decline to 78.95 this week down from 80.93 on June 24 moving below the overbought threshold of 80.00. Investors looking to buy Lockheed Martin should consider doing so on weakness to $156.53, which is a key level on technical charts until the end of 2016. Investors looking to reduce holdings should consider selling strength to $247.40, which is a key level on technical charts until the end of this week. Here's the daily chart for Northrop Grumman. Northrop Grumman closed Tuesday at $200.75, up 14.5% year to date and up 23.5% above its Jan. 28 low of $175.00. The stock set its all-time high of $218.84 on May 12. The stock has been above a "golden cross" since April 18, 2013 when the stock closed at $69.87. A "golden cross" occurs then the 50-day simple moving average rises above its 200-day simple moving average and indicates that higher prices lie ahead. The stock simply traded back and forth around its 50-day simple moving average of $212.39 in reaction to the "Brexit" vote. Here's the weekly chart for Northrop Grumman. The weekly chart for Northrop Grumman has been is positive but overbought since the week of Feb. 19 with the stock above its key weekly moving average of $212.59 and well above the 200-week simple moving average of $131.42. The last test of the 200-week occurred during the week of Nov. 25, 2011, when the average was $54.18. The weekly momentum reading is projected to end the week at 83.80 slipping from 86.10 on June 24 with both readings above the overbought threshold of 80.00. Investors looking to buy Northrop Grumman should consider doing so on weakness to $132.21, which is a key level on technical charts until the end of 2016. Investors looking to reduce holdings should consider selling strength to $222.07, which is a key level on technical charts until the end of this week.